Part of this, as we move on, is knowing and understanding the legal descriptions. As one of these three property type legal descriptions is needed to meet Idaho requirements, as street address or tax parcel numbers alone will not meet acceptable standards to transfer property. These three are Government Rectangular Survey, Metes and bounds, and Recorded play (aka lot and block or subdivision). The rectangular survey system requires an initial point from which all surveys have originated. 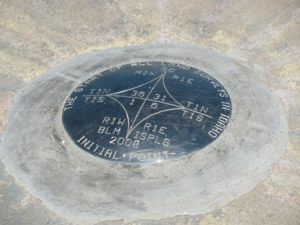 In Idaho, this initial point is located on top of a lava butte one mile east of the Swan Falls Road out of Kuna, just east of the Kuna caves. 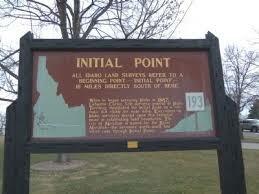 This initial point was established in 1867 and is identified as the initial point, and is the basis of all legal descriptions for the state of Idaho. 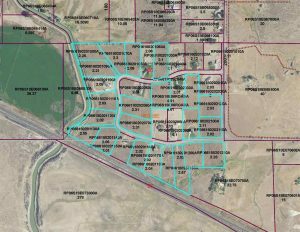 Each township in Idaho consists of 6 miles by 6 miles and contains 36 sections which are 1 mile by 1 mile and contain 640 acres. Each acre is 43,560 square feet. 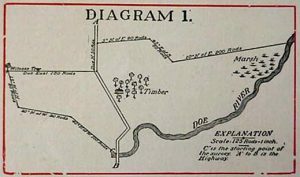 Correction lines, known as a government check, will occur every 24 miles on the guide meridian to accommodate for the curving of the earth. As we move to metes and bounds, as some of the properties that can’t be “explained” by the governments regulatory system as they are irregular in shape and described with longitude and latitude bearings. Recorded plats are used for developments that consist of multiple lots. A subdivision is is a tract of land that is divided into 5 or more lots, parcels or sites for the purpose of sale of building development, whether immediate or in the future. All division of land in lots will be 5 acres or larger and maintained as agricultural land. It is important to know, though, that cities and/or counties may adopt their own definition of subdivision dependent on state code and may be much more restrictive. There are many measuring points in locations, whether it is elevations or air lots, for condos, and the like. As measuring from the surveyor goes, there is a datum, which is the line or surface point in which vertical height or depth is measured and most large cities have a datum point from which each of the monuments are set at a benchmark and are established by this datum point. There are many uses for the elevation benchmarks, including mining, agriculture, storm drainage, flood plains, roadway construction, landscaping and on and on. The Flood plain is needed if there is water located on the property at all. Or if it is near the property. A flood plain is “land located close to or adjacent to a stream or river that is naturally subject to flooding and is knows as a flood zone.” At some points a property could be located 5 miles away from a river or a stream and yet be subject to this as overflow from the river banks and even water canals can cause flooding. Federal banking regulations require flood zone properties to carry flood insurances as a condition of extending a loan to a borrower, therefore as a salesperson in real estate it is very important to be familiar with Special Flood Hazard Are in which the flood zones are shown in detail on the National Flood Insurance Program map. As these zones can change periodically, it is also good to know that you are up to date on the correct map. Easements are the tricky one when it comes to the legal descriptions. A term that you will, more than likely, hear more than not when doing real estate here in Idaho. Especially a lot of the smaller “towns” here in SE Idaho or near the Boise area. Easements provide the right to use the land of another for a particular purpose, it is very important to know that all parties are to know and understand that the easements can create serious limitations. Whether these are recorded or unrecorded, this is where you need to be super particular on what you are attaining, doing, buying, listing, etc. as the legal descriptions identified the specific dimensions and location of properties but may or may not address use by others that are allowed within those boundaries of the property. If at any point the notion of importance to the buyer or seller comes in to play when any type of easement is brought into play (as there are many, from roadway easements, marking off roads, and view or solar easement, which consist of the tops of hillsides for the idea of foliage coming into property lines, etc) you may want to bring in a new surveyor just to re survey the land/property to make sure that all lines and descriptions are correct. As you can tell, there are a lot of exciting things that happen here in the legal descriptions for Idaho. If you have made it this far in the blog, I applaud you, especially if you are going into real estate. As difficult as some of these may be to gather into your mind, they are very important and will, in turn, help you with being a wonderful real estate agent.